HOW TO EASILY FLOCK A CHRISTMAS TREE - HIP HIP HOME! Every time I see one in a store, my eye is drawn to the tree. But as my heart prepares to sail away into Winter Wonderland, my brain interferes to tell me "Would ya look at that floor!". And just like that, my bubble is burst! 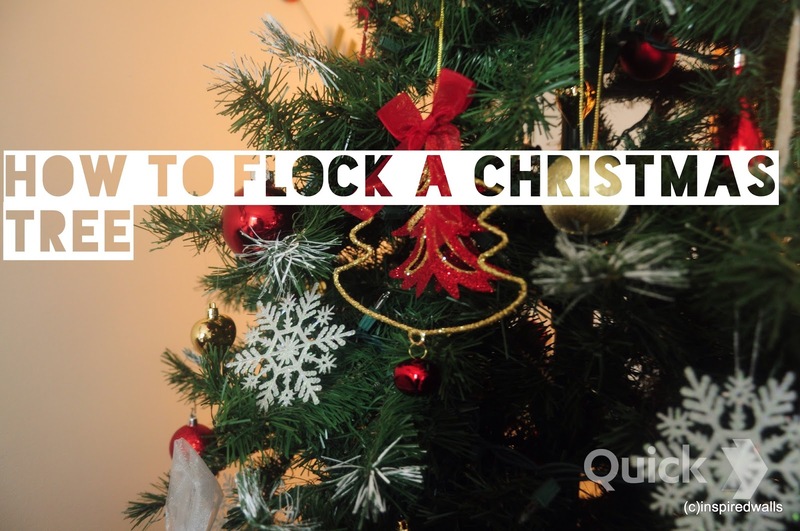 So even though I would love to have a flocked tree, I know I will be constantly bothered by the mess. So how do you get the snowy tips without the mess? First, I tried adding cotton balls to the tips, but it soon started to look like my tree had strep throat. I couldn't even bring myself to take a picture, so I will spare you the horror. Not to mention, it's a fire hazard! I have seen others flocking the tree with glitter and glue. While that works great, I know I will still be bothered by the glitter dust. I guess you could use fur, and I remember reading about that in a blog. It looked wonderful, like a snowy blanket, but the look I wanted was more of a frosted tip. Then there is snow in a can, but I wouldn't be comfortable spraying it inside the house. So just like that, I decided to use craft paint. I applied some paint to the tips and to be honest I fell in love with how it instantly changed the look of the tree. You know how artificial trees can look........ well, artificial? I felt lightening the tips of the branches with paint gave the tree more dimension. The main ornaments in my tree this year are snowflakes, so the frosted tips go really well with the white theme. 20 minutes and Zero dollars are all you need to add frosted tips to your tree! (I am assuming you already have white paint and a brush, cause who doesn't? Not you!). Use a small brush and dab the paint while holding the brush vertical to the branch. Just make sure you only frost the tips, for a more natural look. With a little rubbing alcohol, the effect is easily reversed! So what do you think? Do you like the look of a frosted tree? I would be thrilled to hear from you!